Tonight I discovered something, I’m sure the experienced hand tool wood workers out there already knew. 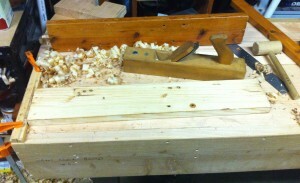 The simple ease of the planing stop. A proper height bench, a good piece of wood and a sharp plane really helps, but the simple ease of a planing stop is pretty cool. Before my instincts would have been to clamp the crap out of it, but I tried something new tonight. I clamped a scrap piece of pine to the end of the bench, laid the wood down resting against the stop with no other clamping, and started planing. And it worked, like a dream. I even did the edge planing with nothing additional. Pretty neat. More later on the project I’m prepping the wood for.